The award recognizes an outstanding young engineer in the off-highway or powerplant industry. Established in 1996, the award was proposed by senior engineering executives and is administered under the auspices of the SAE Engineering Meetings Board in cooperation with AEM. 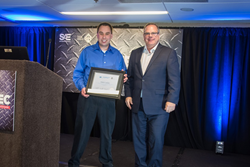 Stephen Lanahan, Design Engineer II with Volvo Construction Equipment in Shippensburg, PA, has been awarded the SAE International/AEM Outstanding Young Engineer Award. Lanahan was presented with the award during luncheon and awards presentation at the SAE 2018 Commercial Vehicle Engineering Congress, recently held in Rosemont, Ill.
During his five-year tenure with Volvo, Lanahan has played a part in various cost reduction, product maintenance, and product development projects focused on compaction machines. Starting out as a part of the Mechanical Engineering team, he worked on both soil and asphalt compactors with an emphasis on hoods and exteriors, designing parts with plastics and sheetmetal. Over the past three years, he has been part of the cross functional team responsible for design of large soil compactors. Lanahan completed his undergraduate studies at York College of Pennsylvania, earning a Bachelor of Science in Mechanical Engineering. An internship at Volvo Construction Equipment, while attending York College, led to his full-time position within the organization.